Cross-border organizing is part of the background of the current crisis. 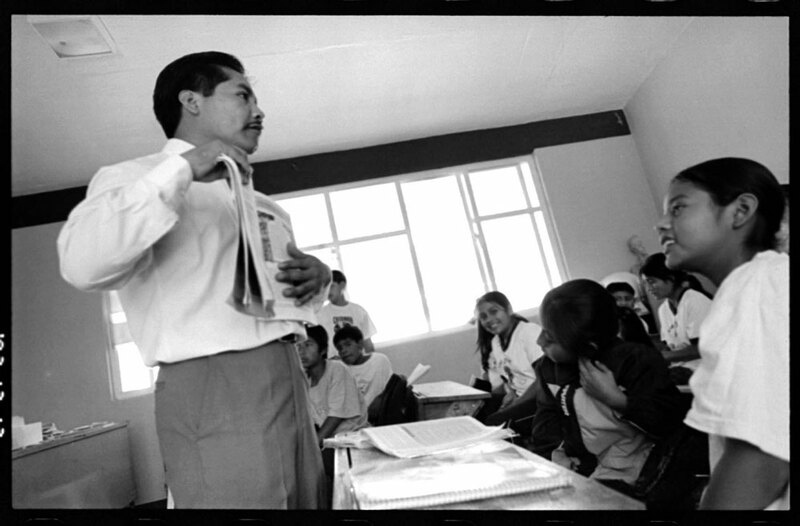 At 8:30 AM on October 21, 2002, Oaxaca state police arrested a dangerous schoolteacher. Romauldo Juan Gutierrez Cortez was pulled over as he was driving to his school in the rural Mixteca region. Police took him to Oaxaca de Ju�rez, the state capital, where he was held for days on false charges. Gutierrez is the state coordinator for the Binational Front of Indigenous Organizations (the Frente), which had organized a loud, embarrassing protest during a visit to Oaxaca by Mexican President Vicente Fox not long before. Oaxaca Governor Jose Murat was out for revenge. As Gutierrez languished in jail, Oaxacan migrant farm workers north of the border in California's central valley picketed the Mexican consulate, held press conferences, and clogged Murat's phone lines with calls and faxes. In Oaxaca itself, other Frente members organized similar protests. After a week, the governor succumbed to the pressure: Gutierrez was released. 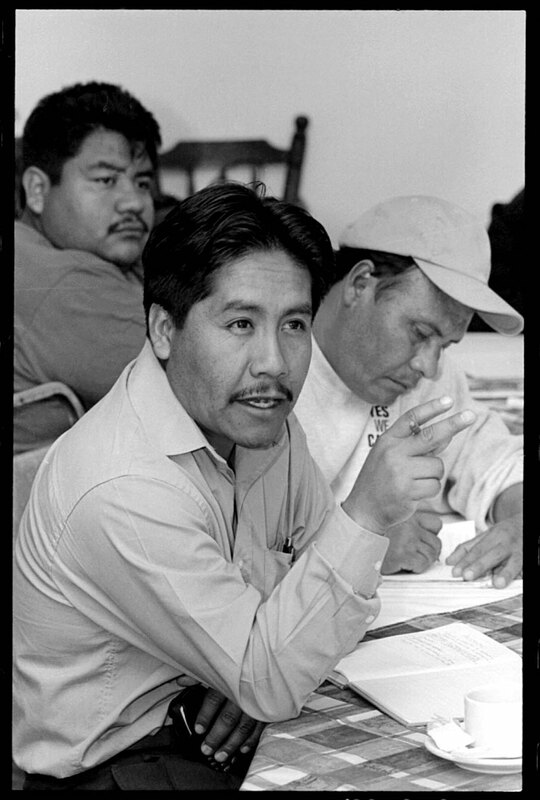 Romauldo Juan Gutierrez Cortez discusses migrant rights with other activists. Since then, the Frente has organized many other binational campaigns. Cooperation across the border is today one of the most important tools Oaxacans have for defending human rights in their home state. Thousands of indigenous people migrate from Oaxaca's hillside villages to the United States every year�among Mexican states, Oaxaca has the second-highest concentration of indigenous residents. They leave in part because of a repressive political system that thwarts economic development in Mexico's poor rural areas. Lack of development in turn pushes people off the land. From there, they find their way to other parts of Mexico or the United States, where they often live in poverty even as they send money home. This economic reality was the central issue in this year's heated presidential election, which was marred by charges of vote fraud. The people who have been driven from Oaxaca to the United States by economic crisis have carried a tradition of militant social movements with them. By organizing across the border, the Frente and other Oaxacan organizations increase their power. Binational pressure freed Gutierrez from Murat's jail, where local efforts alone might not have succeeded. Many other human rights violations in Oaxaca over the last decade have resulted in cross-border resistance, and the Frente was at the heart of many of these protests. Winning political change in Mexico itself is central to the Frente's activity. For Oaxaca's indigenous residents, greater democracy and respect for human rights are the keys to eventually achieving a government committed to increasing rural family income. That in turn might make it possible for people to make a living at home, instead of heading to California for survival. "Migration is a necessity, not a choice," Gutierrez explains. "There is no work here. You can't tell a child to study to be a doctor if there is no work for doctors in Mexico. It is a very daunting task for a Mexican teacher to convince students to get an education and stay in the country. It is disheartening to see a student go through many hardships to get an education here in Mexico and become a professional, and then later in the United States do manual labor. Sometimes those with an education are working side by side with others who do not even know how to read." Lack of economic opportunity in Oaxaca's villages is a result of Mexican economic development policies. For more than two decades, under pressure from the World Bank, the International Monetary Fund, and conditions placed on U.S. bank loans and bailouts, the government has encouraged foreign investment, while cutting expenditures intended to raise rural incomes. Prices have risen dramatically since the government cut subsidies for necessities like gasoline, electricity, bus fares, tortillas, and milk. The government also closed the CONASUPO stores, which bought corn at subsidized prices from farmers to help them stay on the land and sold tortillas, milk, and food to the urban poor. The North American Free Trade Agreement's subsidies to U.S. farmers have forced Mexican agricultural prices down. The end of the ejido land reform system has allowed the reconcentration of land ownership and rural wealth. The sale of government enterprises to private investors led to layoffs and the destruction of unions. Foreign investors may now own land and factories anywhere in Mexico, without Mexican partners. The Mexican government estimates that 37.7%, or 40 million, of its 106 million citizens live in poverty, with 25 million, or 23.6%, living in extreme poverty. According to a representative of EDUCA, a Oaxacan education and development organization, 75% of the state's 3.4 million residents live in extreme poverty. It is the second-poorest state in Mexico, after Chiapas. Meanwhile, President Fox boasts that Mexicans in the United States�often working for poverty wages�are sending home over $18 billion a year. "Migration helps pacify people," Gutierrez says. "Poverty is a ticking time bomb, but as long as there is money coming in from family in the United States, there is peace. To curb migration our country has to have a better employment plan. We must push our government to think about the working class." The economic reforms of the last two decades are deeply unpopular, and people like Oaxaca's teachers would change them if they could. But those who have benefited from them have a big stake in suppressing any dissent or advocacy of political and economic alternatives. Governor Murat's campaign to stifle change by silencing Gutierrez is only a small part of Oaxaca's long history of human rights violations. Oaxaca has many dangerous teachers like Gutierrez. In the in the 1970s and 80s, more than a hundred of Oaxaca's teachers were killed in the struggle for control of their union, Section 22 of the National Union of Education Workers. Today Section 22 is one of Mexico's most militant unions, and in many villages teachers are also community leaders and repositories of Mexico's most progressive traditions. 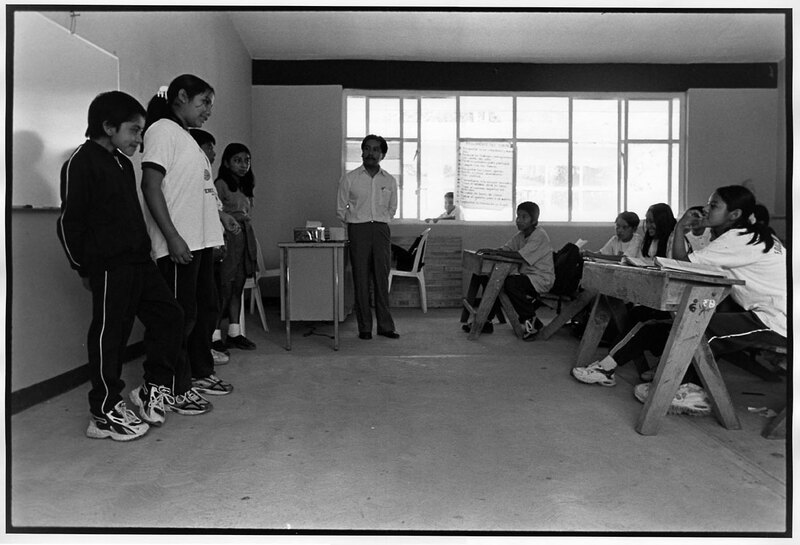 Students give a report in their new tennis shoes with their teacher Gutierrez looking on. On one recent afternoon, Gutierrez stood at the back of a classroom in rural Santiago Juxtlahuaca, dapper in a pressed white shirt and chinos. Two boys and two girls, wearing new tennis shoes undoubtedly sent by family members working in the north, stood at the blackboard, giving a report and carefully gauging his reaction. As they recounted the history of Mexico's expropriation of oil in 1936, a smile curved beneath Gutierrez's pencil mustache. The expropriation was a high point in Mexican revolutionary nationalism. "Education is a very noble field, which I love," Gutierrez says. "But today it means confronting the government. You have to be ready to fight for the people and their children, and not just in the classroom." Not just in the classroom, but throughout Oaxaca and also the United States. Today over 60,000 Oaxacans labor in California's San Joaquin Valley alone. Many times that number are dispersed in communities throughout the United States. In the countryside of the Mixteca, village after village has been emptied of working-age residents. Gutierrez's role in the Binational Front of Indigenous Organizations illustrates his understanding of the need to challenge human rights violations on both sides of the border. If Mexico's indigenous migrants succeed, they may be able to help force a change in the political structure at home, and thereby influence the migration of Mexican citizens abroad. Today, though, Oaxaca's political system is still controlled by Mexico's old ruling Party of the Institutionalized Revolution (PRI). The PRI lost its control over the national government to the National Action Party (PAN) in 2000. While the PAN has more direct ties to Mexico's growing corporate class, and received the bulk of that class's campaign money in the 2006 election, both parties pursue the same neoliberal economic policies that line party leaders' pockets and those of their corporate allies. Efforts to change this system bring down their wrath, as Gutierrez discovered. "Before my arrest I thought we had a decent justice system," he says. "I knew it wasn't perfect, but I thought it worked." In prison, Gutierrez met members of a local union who had been there for months, along with other political prisoners. "There are over 2,000 complaints of political oppression in the state that have not been investigated," Gutierrez charges. His own case adds one more. The news outlets that expose these abuses also find themselves in the government's crosshairs. Noticias, an independent newspaper founded in 1978, learned this the hard way. In 2004, the paper exposed public works fraud in the Murat administration. And in that fall's gubernatorial election, Noticias supported the left-wing candidate of the Party of the Democratic Revolution (PRD). The PRD lost amid charges of vote rigging. On December 1, the same day Murat's PRI successor, Ulises Ruiz, took office, hooligans broke into Noticias's building and threatened the reporters. More provocations followed, and six months later state police and dozens of thugs belonging to the Revolutionary Confederation of Workers and Peasants (CROC) surrounded Noticias's offices. CROC is a labor federation founded by the PRI in the early 1950s. Though in some areas it functions as a normal union, the PRI often uses it to protect employers from labor unrest and to intimidate the party's opponents. Amnesty International reports that 102 of Noticias's 130 employees belonged to CROC, but their relationship with the union had been strained, and CROC leadership called a strike "against the express wishes of the Noticias workforce." The Ruiz administration ordered it to stop publishing. Thirty-one workers decided to defend the office, where they were barricaded in for days and not permitted visitors, or even food and water. CROC's secretary for labor and conflict, Ulises Bravo, told the Miami Herald that the strike was "completely labor-related and [had] nothing to do with a political agenda. Noticias � tried to make this into a political issue because that gets them publicity and sells more papers." Oaxaca's other newspapers stayed out of the fray. The Miami Herald's Jonathan Clark reports that "Privately, editors and reporters say they fear reprisals from the government for reporting on the issue. Editors reluctantly admit they need the government's publicity money to survive financially, and reporters say they fear that they will be harassed or fired for what they write." Facing a news blockade in Oaxaca, the journalists hit the phones. From inside the besieged newsroom, reporter Cesar Morales got on the air in Fresno, California. He was interviewed by Rufino Dominguez, a Frente coordinator, and journalist Eduardo Stanley, cohosts of a bilingual program for Mixtec migrants on community radio station KFCF. Morales described "an assault by more than a hundred plain-clothes police, and thugs brought in to beat us." He called for help, and letters and faxes from California deluged Oaxaca. In this case, binational pressure was not enough. The PRI eventually evicted the journalists and closed the paper's offices. Noticias is still distributed in Oaxaca, but it is written, edited, and printed elsewhere. Nevertheless, Oaxacans in California had developed a new ability to use media in their binational campaigns. Gutierrez in the classroom, teaching his students. Oaxacans abroad don't just protest conditions at home. The Frente defends worker rights in California fields, has convinced the state's courts to provide indigenous language interpreters, and helps keep alive the traditions that are the cultural glue binding together Mixtec, Zapotec, Triqui, and Chatino communities. The Frente was, in fact, founded in California. Leaders like Dominguez have a long history organizing strikes and other movements in Mexico. When they arrived in California in 1987, they started the group with meetings in the San Joaquin Valley, Los Angeles, and San Diego. At first it was called the Mixtec/Zapotec Binational Front, because organizers wanted to unite Mixtec and Zapotec immigrants, two of the largest indigenous groups in Oaxaca. Soon it had to change its name. Triquis and other indigenous Oaxacans wanted to participate, so the organization became the Indigenous Oaxacan Binational Front. Then Purepechas from Michoacan and indigenous people from other Mexican states also joined, and it became the Binational Front of Indigenous Organizations. Through all the changes, its binational character has only grown stronger. Oaxacans have formed many other organizations during their long migration through Mexico and the United States. Most of these organizations are composed of members from a single town, and many of them are not as political as the Frente. The Frente is also different in that it unites people speaking different languages, from different indigenous groups, in order to promote community and workplace struggles for social justice. Racism against indigenous people in Mexico has required them to develop a history of community resistance, and to fight for their own cultural identity. Centolia Maldonado, one of the Frente's leaders in Oaxaca, recalls her bitter experience as a migrant in northern Mexico. "They called us �Oaxaquitas'�Indians," she remembers. "The people from the north were always valued more. There is terrible discrimination when people migrate." In 1992, the Frente used the celebrations of the 500-year anniversary of the arrival of Christopher Columbus in the Americas as a platform to dramatize its call for indigenous rights. Dominguez says the protest countered "people who say that Christopher Columbus was welcomed when he came. They never talk about the massacres or the genocide that occurred in our villages, on the whole of the American continent. We wanted to tell the other side of the story." The Frente's response to the Zapatista uprising on January 1, 1994, strengthened its commitment to cross-border action. The Frente pressured the Mexican government to refrain from using massive military force in Chiapas. From Fresno, California, across the border to Baja California and Oaxaca, Frente activists went on hunger strikes and demonstrated in front of consulates and government offices. That action, Dominguez says, "helped us realize that when there's movement in Oaxaca, there's got to be movement in the United States to make an impression on the Mexican government." Participatory democracy is important in indigenous village life, and the Frente honors this tradition in its binational assemblies, where members discuss its political positions in detail. As a result, those political positions take into account the transnational nature of members' problems. The Frente opposes U.S. proposals for guest worker programs, arguing that they treat migrants only as temporary workers, not as people who belong to and are creating communities. Instead, the Frente calls for the legalization of undocumented migrants in the United States. It also demands that the Mexican government fulfill the right of Mexican citizens living in the United States to vote in their country's elections. The Fox administration agreed to create a system to handle those votes in the 2006 election, but there were so many restrictions that only about 40,000 of the estimated 12 million Mexican citizens in the United States were able to cast ballots. In the late 1990s, the Frente in Oaxaca began an alliance with the PRD. Dominguez explains, "Mexican electoral laws don't permit a social organization to run independent candidates, so we have to make an alliance. Within the PRD there are divisions and internal problems, but it's all we have." Within this alliance, the Frente keeps its independence. "We should have a relationship with political parties without losing our identity and being dependent on politicians," Dominguez says. In the recent presidential campaign, the Frente supported the PRD candidate, former Mexico City mayor Andres Manuel Lopez Obrador. Frente activist Leoncio Vasquez said the country faced a clear choice in political direction. "Lopez Obrador declared openly that he'd put poor people first," Vasquez explained. "He's against corruption and corporations who violate workers' and human rights." Raising rural income was the centerpiece of Lopez Obrador's proposals on migration. He was particularly critical of President Fox's support for the Bush guest worker proposal. During the campaign, attacks on human rights in Oaxaca escalated. On May 19, Moises Cruz Sanchez, a PRD activist in the Mixtec town of San Juan Mixtepec, was gunned down in front of his wife and children as he left a local restaurant. The two gunmen fled, and police couldn't seem to find them. That month in Fresno the Frente organized demonstrations against a planned visit by Governor Ruiz to California. Response to the protests revealed increasing cooperation between U.S. and Mexican authorities. After receiving a copy of a letter sent to the Mexican consulate to protest Ruiz's visit, Detective Dean Williamson of the Fresno Police paid a surprise visit to the Frente's office on Tulare Street. "It's an official procedure," said Williamson, "in which we're trying to clarify possible threats affecting public security." Then violence escalated again in Oaxaca. In early May, the state's teachers struck for higher salaries and an end to human rights violations. Thousands of teachers occupied the main square in the state capital. Over 120,000 Oaxaca residents joined them in the largest rally in the state's history. On June 11, Ruiz promised business owners he would use a heavy hand to put down the protest. At four in the morning on June 14, helicopters began hovering over the tents of the sleeping teachers. As parents woke their children, billowing clouds of tear gas filled the cobblestone streets. Hundreds of police charged in. Within minutes, scores were beaten, and one pregnant woman miscarried. But Ruiz underestimated the teachers. They retook the square at the end of the day, and the following morning 300,000 people marched through Oaxaca demanding Ruiz's resignation. In the following weeks, the protestors formed the Oaxaca Popular People's Assembly (APPO). Doctors and nurses joined, shutting down clinics. The government responded with increased violence. A state university student was killed in the street, and Jose Jimenez Colmanares, husband of a striking teacher, was gunned down during a protest march. Gunmen fired on the Channel 9 radio station after it had been occupied by demonstrators. Two reporters from Noticias, which recently opened another editorial office in the Oaxacan capital, were also shot at. The APPO has many active indigenous members, some of whom also belong to the Frente. In the Mixteca, protestors occupied the Huahuapan de Leon city hall. Ruiz issued arrest orders for 50 leaders, including three Frente statewide officials. On July 2, Mexicans went to the polls. The results gave a microscopic 200,000-vote majority to PAN candidate Felipe Calderon. Demands for a recount and accusations of fraud were immediate. A million people rallied in Mexico City's main square on July 16, and two million on July 30, to demand a recount. The PRD and its candidate refuse to accept the results without one�a contrast to 1988, when leftist candidate Cuauhtemoc Cardenas conceded although it appeared that fraud robbed him of victory. Whether the PRD will get the recount it demands is still unclear. Regardless, millions of Mexicans see a clear difference in political direction between the current political establishment and the PRD and the social forces that support it. Pointing to attacks on striking steel workers in Michoacan and Sonora, the stationing of tanks outside the Mexican Congress, and the raging conflict in Oaxaca, Dominguez says that "A tiny group is trying to hold onto power by increasingly violent and illegal means." But many Mexicans are challenging the lack of human rights that keeps that establishment in power. The Frente is an important part of that movement. "Indigenous people are always on the bottom in Oaxaca," Vasquez says. "The rich use their economic resources to maintain a government that puts them first. Big corporations control what's going on in Mexico, and those who criticize the government get harassed constantly, with arbitrary arrest and even assassination. That's one of the reasons why people from our communities have been forced to leave to find a means of survival elsewhere."